The new Smart ForTwo Coupe is back with a mini-sized bang. Expect a car that’s easy to drive, cute to look at and cheap to run. With prices starting out from just under ten grand, that’s all hard to argue with. But here’s the best bit – it shares parts with the Mercedes C-Class and has things in common with the Porsche 911. Like Lady GaGa, the Smart car was born this way. In the city, it’s your best mate as it skips through traffic on the way to work while negotiating those otherwise tricky turns with ease. OSV takes a closer look at what it’s all about with our 2017 Smart ForTwo Coupe review. The new model looks a lot different to how it used to, and it drives a lot differently too. Everything has been improved, from the way it handles to its suspension setup. It’s actually the rear suspension that has been taken from the aforementioned Mercedes C-Class. As a result, the car feels more comfortable than its predecessor, and it even cushions the blow from broken surfaces quite well. Unusually for a city car, the engine is in the rear. In this way, it reminds us of the Porsche 911. Of course, that’s where the similarities start and end (did they really start to begin with? ), but the engine has been put in the rear to improve grip. And when you improve grip, you improve the fun. 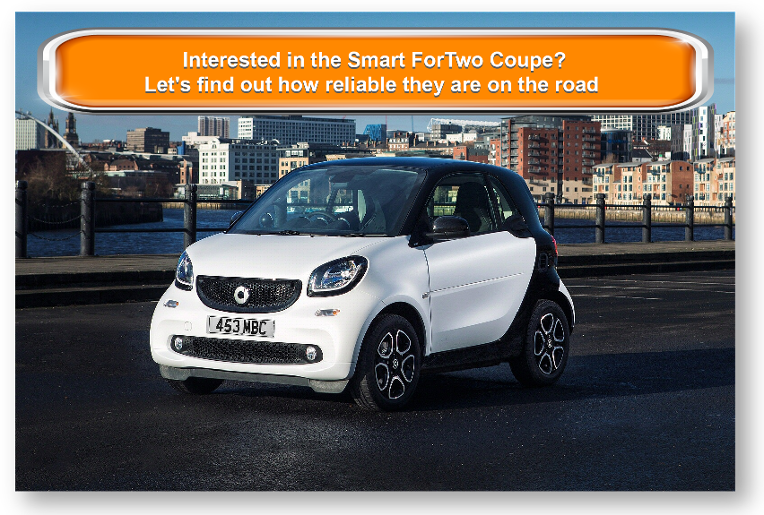 As such, the ForTwo Coupe is a pleasure to drive in the city. The positioning of the engine also means the front wheels have more freedom of movement, with the car boasting a turning circle of 6.95m. It’s a lot more composed in corners these days, but we don’t want you getting too carried away – this isn’t a car built for sportiness. Instead, the focus is very much on comfort, and this is something you’ll notice if you’re ever brave enough to leave the safety of the city. There is a good amount of rear-end grip, but not so much at the front-end. Combined with light steering, it can knock your confidence. In terms of the engines, there are no diesels available, which means your choice is limited to a pair of petrols. The smallest of the two is a 1.0-litre 70bhp unit, which can get you from rest to 62mph in 14.4 seconds. That’s fine in the city, but it will feel out of its depth on the motorway. A turbocharged 0.9-litre unit is a better bet for longer trips. It develops up to 89bhp, and covers the 0-62 dash in a respectable 10.4 seconds. It feels comfortable enough with motorway speeds and is our top pick. However, should you desire more power, a 0.9-litre 108bhp engine can get you from a standstill to 62mph in just 9.5 seconds. And with tweaked suspension and steering, it’s one for the enthusiasts. The old model wasn’t the nicest to look at, and it didn’t feel all that nice either. The new Smart ForTwo Coupe is much better on both fronts. Thanks to hi-tech suspension and a brand new automatic transmission, it’s a lot comfier. Insulation does remain an issue. You have to work the engines hard, and their rumble gets inside the cabin pretty easily. Wind buffeting is a problem, too. The dashboard will appeal to younger drivers who’ll appreciate its funky shapes and smart design. Smart has been unsparing with their use of colour, and you get to customise your dash to get the look you want. The quality of the materials is decent, too. In terms of how practical it is, you only need to take a look at the car to see that it won’t score well on this front. There are just the two seats, but Smart has at least made a good fist at getting as much space as possible out of its compact dimensions. As far as two-seaters go, it’s fairly roomy. The large doors open wide, headroom is good thanks to its tall shape, and visibility is good. Admittedly, the glovebox and door bins aren’t really spacious, but the boot measures a respectable 260-litres, and comes without a loading lip. It also gets a useful flat floor. Standard kit is good, with the entry-level model getting remote central locking, LED daytime running lights, electric windows and stop-start tech. Spend more than £10,000 on the Passion model and you also get 15” alloys, climate control, orange/black upholstery and cruise control. The Prime trim adds heated seats, a panoramic sunroof and a leather interior, while the Prime Sport model comes with black 16” alloys, a chrome exhaust and lowered sports suspension. The Brabus Sport model rounds the range off with 17” alloys, a sports steering wheel and 17” alloys. It’s normal to be worried that a small car like this won’t be safe, and it only scored 4/5 when crash-tested by Euro NCAP. Its safety kit includes airbags, lane-keeping assistance and a forward collision warning system. Prices for the new car start out from £9,995 and rise to £20,205. If you prefer to lease, you can pick up a deal from just £106 + VAT per month. For more information on our leasing deals, check out our page here. In terms of its running costs, the fact that this Smart car is so small helps to keep its costs down. The 1.0-litre 70bhp engine is the cheapest to run, returning 68.9mpg and emitting 93g/km of CO2. The turbocharged 0.9-litre petrol unit adds more power, costs £600 more, and returns 67.3mpg while emitting 94g/km. Both models cost £140 a year to tax, and if you want the DCT automatic ‘box, you’ll need to fork out an extra £995. The Smart car has always looked cute and different, but in the past it’s looked too much like a novelty. Now, it’s much more assured. You’ll have a ball as you zip through the town, leaving hefty saloons trailing. It’s pricey, but you get what you pay for. To get the best out of it, you’ll need to pay more than the £9,995 starting price. It won’t be a total nervous wreck, but make no mistake – this isn’t a car built for faster roads. 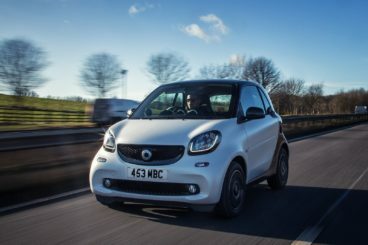 Let’s see how the car fares against its rivals in the comparison section of our 2017 Smart ForTwo Coupe review. The new Renault Twingo Hatchback is a cute, cheery city car that’s got two extra seats over the Smart car. Like the Smart ForTwo, the Renault is right at home in the city. It’s entertaining to drive, comes with lots of grip and handles well. The problem for both is that so many rivals have the same attributes. So how do you make your choice? What sets the Twingo Hatchback apart from its rivals is its rear-wheel-drive system. However, this isn’t always an advantage. When you take weight away from the front, you lose a bit of composure and therefore the driver’s confidence diminishes a bit. Another distinguishing feature of the Twingo – at least for those powered by a turbocharged TCe engine – is a variable power-steering system that feels somewhat artificial. In terms of the engines, all are petrols . The smallest in the line-up is a 1.0-litre engine that develops just 69bhp, and takes 14.5 seconds to complete the 0-62 dash. An 89bhp 0.9-litre petrol covers the same distance in 10.8 seconds, while a 109bhp variant of the same-sized engine can get you from rest to 62 in 9.6 seconds. In terms of their running costs, the 1.0-litre petrol unit is the cheapest to run. It benefits from stop-start tech, and can return 67.3mpg while emitting 95g/km of CO2. The other models don’t benefit from stop-start, and as such you’ll be looking at returns of around 56mpg, and an increase in emissions to as high as 112g/km. Inside, the Renault Twingo Hatchback is a model of practicality, comfort and trend-setting. It’s also better built than last time, even if the plastics aren’t quite as robust as some rivals. Insulation is a bit of an issue if you pick the most powerful engine, but even with the smaller engines, road and wind noise is problematic. The seats are comfy, there are plenty of lively, colourful interior trims to choose from, while top-spec models get some neat touches, such as a leather steering wheel. 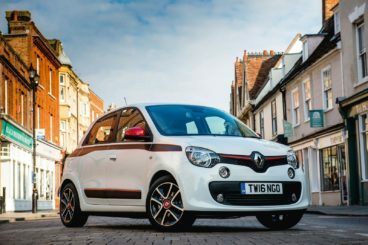 Is the Renault Twingo Hatchback practical? On first glance, you’d say No. But it surprises us all. It has two more seats than the Smart car, excellent visibility, and a good amount of room up front. That said, your rear passengers might prefer that you didn’t have those extra two seats, as pop-out windows and a lack of backseat room is an issue. Still, there are lots of useful storage spaces, you can choose from a three or five-door model – but the boot measures just 188-litres. That’s way smaller than the Smart ForTwo Coupe, and it can only be increased to 219-litres if you lock the rear seats so that they stand upright. 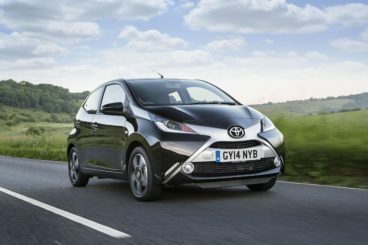 The new Toyota Aygo Hatchback is an economical, agile and stylish city car that is in many ways the perfect package. Its engines are thrifty and fun, with the Aygo feeling right at home in the city – just like the Smart car. There isn’t a lot to say about its surefooted performance in urban jungles that hasn’t already been said about its rivals. It’s easy to park, easy to drive, and offers good visibility. Its steering is more direct than last time, but body lean in bends is still a bit of an issue if you approach corners too quickly. Moreover, while the ride quality is just fine on smoother surfaces, the car crashes over poorer ones. In terms of the engines, there is only one available – a 1.0-litre petrol unit that powers two rivals, the Citroen C1 and the Peugeot 108. However, for those two cars this engine is just the entry-level option. Here, it’s all there is. It’s slower off the blocks than the Smart car, taking 14.2 seconds to zoom from rest to 62mph when paired up with the manual, and a sluggish 15.5 seconds when paired up with the automatic. In the city, it’s just fine. On the motorway? 68bhp is scary, but the car is quiet out there. It’s dirt cheap to run, though, and can return almost 69mpg while costing nothing in road tax. Inside? Insulation has been improved thanks to some sound deadening materials. While you will hear a distinctive engine thrum, it’s sporty and kinda pleasant. Fit and finish has also been improved, and the Toyota Aygo Hatchback is a genuinely nice place to spend your on-the-road time. The dash is attractively finished in gloss black, and there are only a few harder plastics here and there. In terms of how practical it is, it’s got the four seats but its dimensions are shorter than most four-seater city car rivals. It has more headroom, though, thanks to its double-bubble roof. Moreover, the designers have done a superb job at getting the most out of its compact dimensions, with rear legroom the only issue for passengers. However, a 168-litre boot disappoints and you’ll need to decide whether the two extra seats are worth such a reduced luggage capacity. The Smart car has come so far. What was once a noisy novelty is now a city car to be taken seriously. 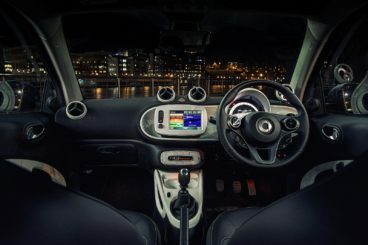 It’s still got some of the spirit of the first incarnation that a certain demographic took to their hearts, but in 2017 the Smart ForTwo Coupe has grown into a mature, practical, fun two-seater designed for the commute to work.